Would Harry Potter live here? So lets forget all the troubles with my car and focus on some of the positive points of my little break away to France. 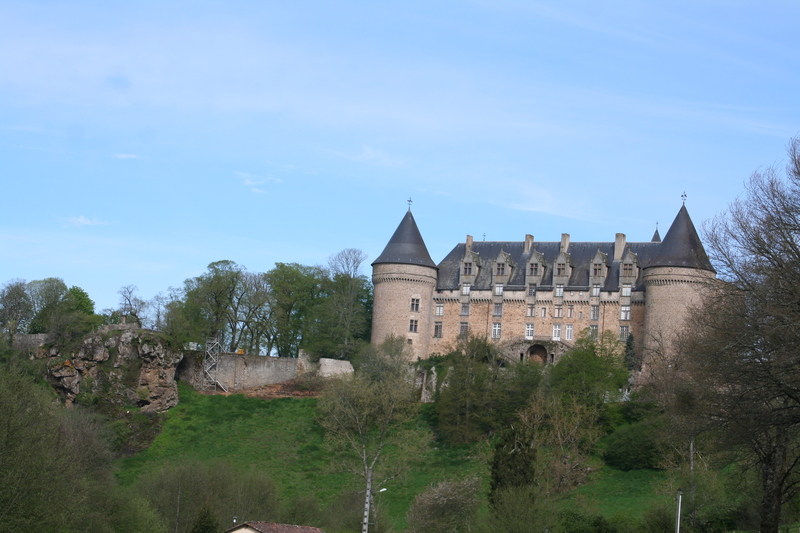 In the picture above, you will see Rochechouart Chatteau. It is beautiful and has been turned into a modern art gallery (not my bag unfortunately). Whenever we have brought friends over, especially those with kids, they have always looked up in awe and shouted “Its Hogwarts”. From a distance, you can see where they get the idea from. This is just one of the photos from my trip over to France. I thought I would share it with you. I forgot to mention yesterday. P&O should also be thanked as I was not charged for changing my ticket. The P&O ticket office could have really upset me and added the ticket change amount to my woes, but they skipped it and just reprocessed me for a later sailing. So thanks to the P&O ticket office too. Many times these people go un-thanked and I am sure they help and assist many people each day. It’s not often I am really pleased with the service I receive but hands up and applaude P&O ferries. With the problems I had in France, the French Recovery people towed me all the way to Calais. But they did not just drop me at the gates, oh no, they took me through passport control, tickets etc everything. P&O were great, they organised new tickets, obviously we missed our ferry. They arranged for a tow onto one of their ships and also a tow off. Now that is a great organisation, and good to know if you are stuck in France. The words of get to the port will now always be on my mind. Well done P&O, I am grateful. Here is a fun point. As stated, I was in France for a few days and had the misfortune to break down on my way home. Being an AA member, but only for the UK, we thought we would phone them for advice. Having been transferred twice, to numbers that were for closed offices, we finally got a recorded message saying as we were on a French motorway, they could not offer any assistance, being a member or not, due to the legalities of French motorways. Well, as it took over an hour to finally see a French recovery vehicle, we decided it was better to bite ther bullet and get towed to Calais, where P&O would look after us. 1) AA should not pass you on to closed offices, luckily I was with my wife, but imagine if she was on her own in France. 2) When we did speak to a person directly, it was an Indian call centre. I have no problem with this but the problem arose that the call centre person did not actually know where Dover Port was, and expected us, at that stage sitting on a Ferry in the middle of the channel, to give them a postal code so they could look it up. The sad phrase of Google it comes to mind. Well, believe it or not, I thought I would spend a few says in the south west of France at my little house. The weather was really hot, the people and surroundings were lovely. I had a few bits of fun on the way back which I will list each in turn as I think they all have valid reasons for me either being happy or sad. If it was St Patrick’s Day, many of you would run off to the nearest ale house and quaff Guiness. So why should English people want to celebrate St Patrick’s and not St George’s day. Well I think it comes down to public perception and pressure. Do any of you remember the furst gulf war, where people were hanging flags and were being told to take them down. Also during the football competitons, people were being asked to take the flag down. It all boils down to national identity, our Government seems determined to quash our identity and present us with a boil in the bag, one size fits all european identity. well not this time. St Georges day should be a day to celebrate great English achievements and developments. What about Waterloo? The Battle of Britain, Trafalgar day. All great moments in history, but also what about the launch of the Titanic, the launch of Concorde and the Queens birthday. All these events should be important, and I believe the use of St George;s Day to promote these events is crucial. We are not a piece of European land, we are England, we are proud.